Clone has been on the web since 2010. The business has developed and changed over this time but unfortunately the website had got a little left behind. The old Clone website wasn’t very mobile friendly and as more and more people are using mobile devices to access the internet it was vital that the Clone website was easy to use on all devices. So the time had come to build a brand new Clone website that uses the latest web technology and is totally mobile friendly. Making these updates has also given Clone the opportunity to create this blog section, this gives Clone a platform to talk about the latest Clone product developments and updates. To accompany the blog, Clone has also started a free newsletter. Subscribers to the newsletter will receive email notifications of any new blog posts, as well as Clone news, product reviews, and special offers etc. You can sign up for the newsletter here. Our aim is to create high quality router duplicators at an affordable price. However high quality and affordability don’t always sit comfortably together. High quality = no expense spared, whereas affordable = compromises – it’s difficult sometimes to find a balance between the two. 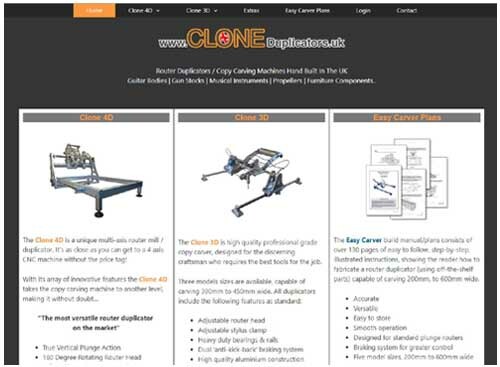 We have already made the Clone 4D more affordable by creating the Clone 4D kit which has given customers the opportunity to build a 4D, this route gives a saving of around £1800 compared to a fully built machine. To reach more customers and to reduce costs of owning one of our duplicators even further, Clone is considering offering digital download information packs for both the Clone 3D and the Clone 4D. These information packs contain no physical parts, they will consist of all the information and files required to build either the 3D or 4D duplicator, and rotating clamping system. In order to gauge whether there is going to be a demand for these products, Clone needs your feedback on the idea. If the enough people are interested in buying such a product, then Clone will offer these downloadable information packs for sale. What’s the best Wood Carving Machine for you or your business?